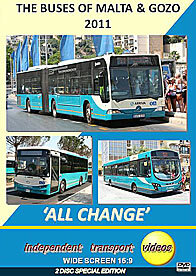 In Malta and Gozo the 3rd July 2011 saw the start of a brand new era of public transport with the introduction of an entirely new bus network by Arriva. The new operator planned to place in service 264 buses replacing the previous 508 route buses. The new fleet is made up of new and second hand vehicles. This consists of 176 new Chinese-built King Long single deck buses, of which 125 are 12 metres and 51 are 9 metres long. Two new Bluebird Tucano 17 seaters, built in the UK at Scarborough and 46 refurbished articulated Mercedes-Benz Citaros from Arriva London. At the time of our filming the arrival of 10 9m hybrid Optare Solos were still awaited. 28 former local yellow King Longs were also being refurbished as well as Scarnif bodied MANs are due to enter service in due course. To initially help out, from the UK, a number of Optare Solo SRs from Arriva Derby and Wright Pulsar 2 bodied VDLs from Arriva Merseyside have arrived on Malta and Gozo and are seen operating on this video programme, as well as some surprises! Our filming initially shows some of the preparation work taking place on Friday 1st July and in the morning of the 2nd. Later on the same day at 21:00 hrs a number of vehicles arrive for a grand launch of the new era, with flashing lights, music and fireworks heralding the new beginning! The first day is recorded firstly at Birzebbuga and then at the new bus station at the city walls in Valletta. All the new buses are in evidence making a completely different scene to that we have been used to in Malta. Further filming takes place by the War Memorial before some evening scenes in Sliema. Duration : 183 minutes (approx).